Doc submitted Apolo, but Apolo hit Doc with a chair and Diablo got the pin. Pantera's first match here since August and Sagrada's first match since 2012. Tecnicos took 1/3. Pirata faked a foul from Sagrada in the second, Sagrada fouled him and faked a foul in the third. Pantera tried a tope on Trauma I in the third, but Trauma I just moved out of the way and Pantera crashed and burned. Groon's match here since 2008. Tecnicos took 2/3. A man in an LA Park mask attacked Wagner after the match, then ran away. Main shows debuts for all except Niko. straight falls for the rudos, Fuerza catching Golden in a submission by surprise. 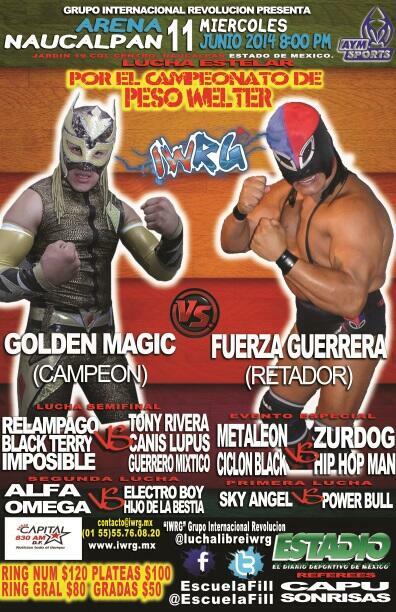 Golden Magic, the champion, demanded Fuerza Guerrera face him in a title match. Rudo took 1/3. AK-47 faked an injury and 911 (already eliminated) snuck a foul in on Golden Magic. Trauma II jumped Super Nova before the match. Tecnicos took 2/3, the last when Eterno tried to sneak in a foul on Toscano but was caught and disqualified. Bestia's first match since he lost his mask. In the third, Diablo snuck in a foul on 911, but AK47 snuck in and returned the favor and the Oficials took the win. 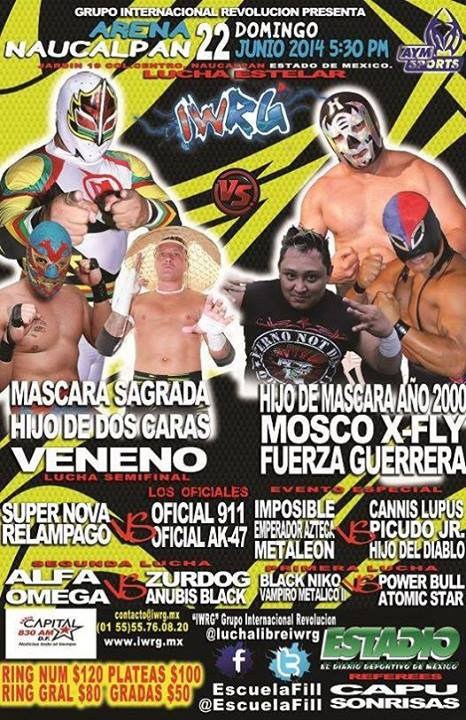 Oficial 911 & Oficial AK47 are the Gringos VIP fall on first defense. Dos Caras was honored before the match. Tecnicos took 2/3. Usual crowd brawl with Park & Wagner. Park & Morgan took the first, Wagner & Dos the second. During the third, a person in a LA Park mask (probably meant to be the same one as two weeks ago) ran in and attacked the actual Wagner. That appears to be the end of the match, though it's not clear. 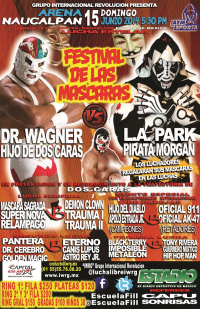 Fake LA Park unmasked as - Mascara Sagrada! 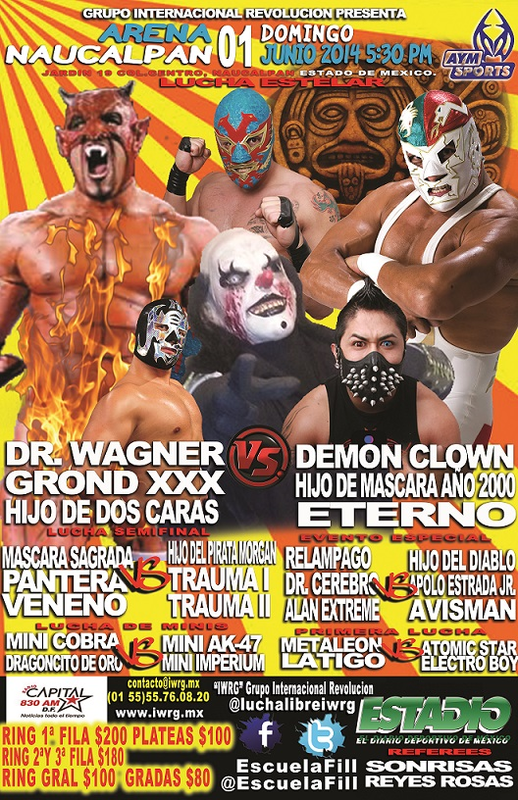 Demon Clown came out to be helped, with Demon, Park and Wagner all apparently allied and Pirata Morgan going with the tecnicos in the fight. Everyone made challenges - which turned out to be a cage match for the IWRG Heavyweight Title for some reason. 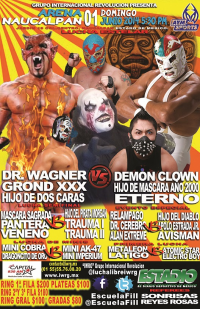 No idea why Ciclon Black is now on the tecnico side. A man in an Electro Boy mask ran in and hit Dr. Cerebro with a piece of dry wall. Team Neza picked up the win, and the man unmasked to reveal - Apolo Estrada Jr.
Tecnicos took the first, rudos took the second (both when the other side was winning most of the fall.) Terry & Mixtico double pinned in the third, and Fuerza snuck in a foul on Magic to win. 3) Emperador Azteca, Imposible, Metaleón b Alan Extreme, El Hijo del Diablo, Picudo Jr.
Alan Extreme was back on the rudo side to replace Canis Lupus. Tecnicos took 2/3, despite Azteca & Imposible not getting along (they were feuding before Imposible turned tencico and Azteca was hurt.) Rudos turned on Alan after the match. Rudos took 1/3, 911 fouling Nova while also faking a foul to get the DQ call. Canis Lupus replaced X-Fly. 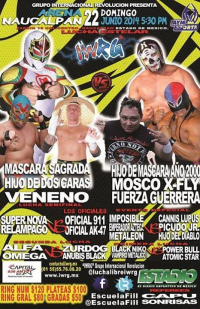 Rudos took 1/3, Mascara taking Caras' mask in the third. Those two feuded the entire match. 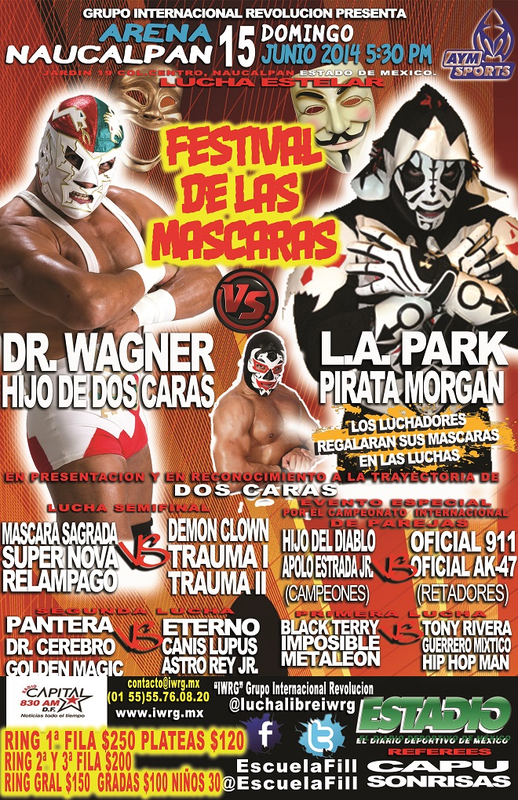 Lupus is noted as attacking Mascara Sagrada's "recently operated elbow" to set up a submission in the second fall. Tecnicos took 1/3, Cerebro beating Apolo to continue their feud. Azteca & Imposible did not get along, challenged each other to a mask match. 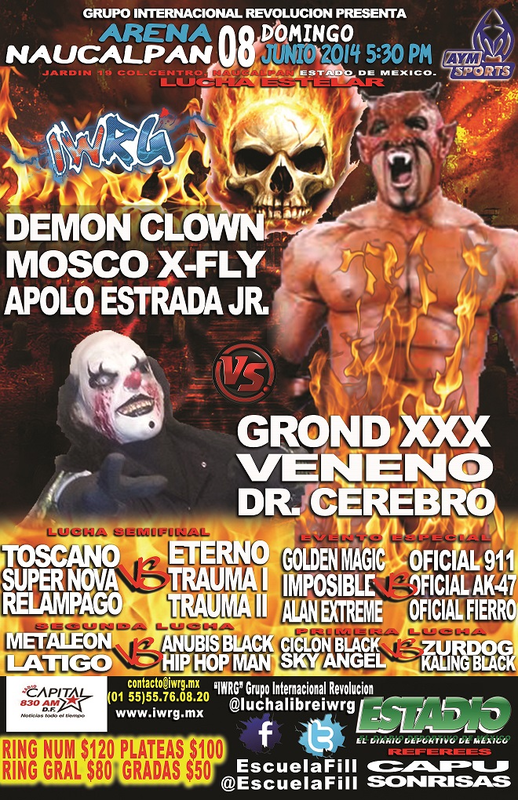 Dr. Cerebro beat Apolo to win the title back. Apolo falls on a second defense. Hair match challenges followed. Straight fall win. Dos asked and will receive a Junior title shot. Rudos took 1/3. Demon Clown (mentioned as Canadian in the Gladiatores recap) and Villano IV feuded, with Demon Clown faking a foul in the third.